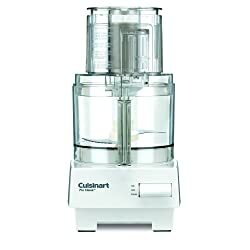 THE CUISINART MODEL DLC-10S HAS BEEN DISCONTINUED. The review for this discontinued Cuisinart model has been removed because the DLC-10S model is no longer available. However, you’ve still come to the right place! At The Healthy Kitchen Shop you’ll find general information, detailed reviews, and comparison charts that will help you determine which model is the right choice for you. Below is a complete list of resources on this site. Key tips and information to help you decide which model is best for you – Also includes links to reviews and a sortable quick reference chart. If you’re not sure what you want, this is a great place to start. Thanks for the very thorough review. I found your details to be the most comprehensive available. Since this is a first purchase for me, having everything summarized was very helpful! I’m very glad you found this review useful. Thank you for your kind words, and thanks so much for visiting the site!